Shown with Coordinating Collection Three Seat Sofa. Sofa Shown May Not Represent Exact Features Indicated. If you are looking for casual comfort and convenience in your family room, this powerized console sofa is worth a serious consideration. A comfortable piece that is made in the USA, this American made sofa features plush padded seat cushions with defined headrests and pad over chaise footrests for unbroken comfort. Smooth track arms and tight pulled upholstery creates a casual style with a fresh feel. Visible seam stitching provides a fine finished look, accompanying the contemporary style with a casual accent. A family room piece for a movie theater experience, this upholstered sofa is available in a standard reclining console sofa and power reclining console sofa option. 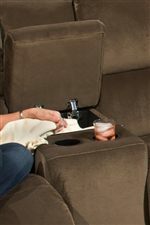 The Fandango 884 Power Headrest Console Sofa with Storage and Cup-Holders by Southern Motion at Sparks HomeStore & Home Furnishings Direct in the Thatcher, Cottonwood, Safford, Sedona, Morenci, Arizona area. Product availability may vary. Contact us for the most current availability on this product. Padding & Ergonomics Durability is built-in for life, with 2.2 density foam, 28 pound compression and fiber wrapped seat cushions for unbelievable comfort now and years from now. 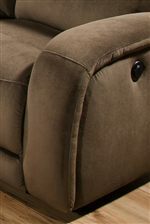 Back cushions are filled with polyester fiber. This reclining furniture collection with manual and power options will accent your family room with casual comfort and an updated style. Designed by a well-known manufacturer, these American-made seating pieces have durability that's built for life, featuring 2.2 density foam seating, 28 pound compression, and fiber wrapped seat cushions for unbelievable comfort you'll enjoy for years. Plus, their smooth lined frames with padded track arms and curvaceous channel backs complement their comfort with fresh, modern style. The Fandango 884 collection is a great option if you are looking for Casual furniture in the Thatcher, Cottonwood, Safford, Sedona, Morenci, Arizona area. Browse other items in the Fandango 884 collection from Sparks HomeStore & Home Furnishings Direct in the Thatcher, Cottonwood, Safford, Sedona, Morenci, Arizona area.